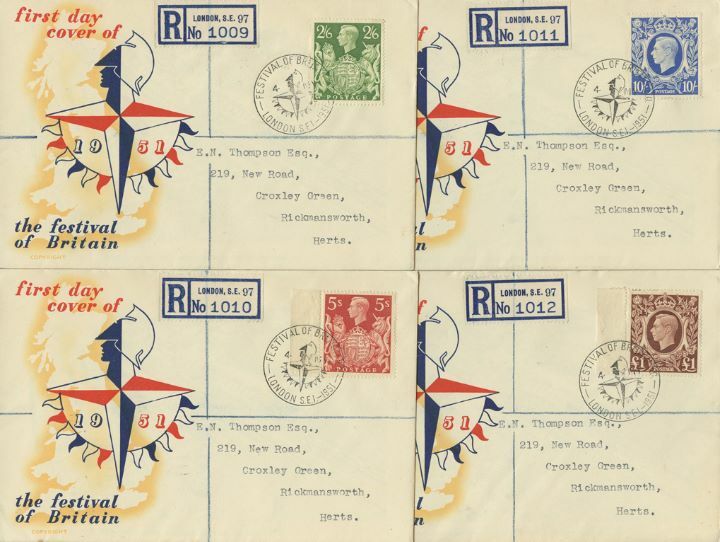 Notes: Amazing set of four George VI definitive high values - I have never seen these on illustrated covers before - these are postmarked on the first day of the festival - not first day of issue. UNIQUE SET- I DON'T THINK YOU WILL FIND THESE ANYWHERE ELSE. The above Royal Mail KGVI: Set of 4 Festival High Values stamps were issued on 03 May 1951 by Royal Mail and feature the following stamp designs: . The King George VI High Value Definitives first day cover with the London SE1, Festival of Britain, Special Handstamp postmark has been produced by Official Sponsors and features these stamps which can make a very collectible and lovely gift.